In 1545-1546 Uesugi Tomomasa, with the assistance of his powerful relative Uesugi Norimasa and the Kamukura shogun, Ashikaga Haruuji, besieged the strategically important Kawagoe Castle, then held by the Hojo clan. Despite an overwhelming attacking force, numbering around 85,000, the 3,000 men in Kawagoe Castle's garrison, led by Hojo Tsunashige, held out until a relief force arrived. That relief force, numbering only 8,000, was led by Tsunashige's brother, Hojo Ujiyasu. 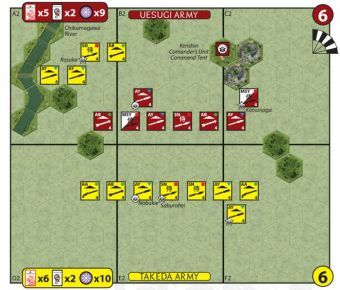 A single warrior was sent to sneak past the Uesugi siege lines to inform the garrison of the relief's arrival. 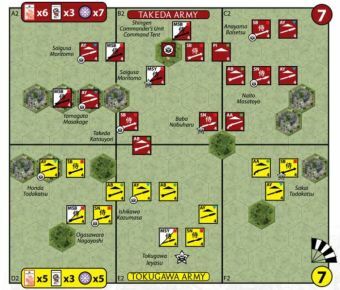 Though still strongly outnumbered, ninja spies informed the Hojo forces that the attackers, Ashikaga Haruuji in particular, had relaxed their vigilance due to their overconfidence in victory. 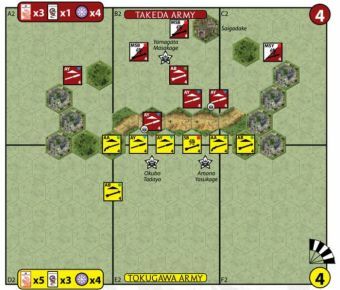 The Hojo tried a risky tactic, coordinating a night attack between the garrison and the relieving force. The Hojo samurai were ordered to leave behind any heavy armor, which would slow them down and perhaps reveal their position, and were forbidden to take the heads of their defeated enemies, denying themselves much honour. 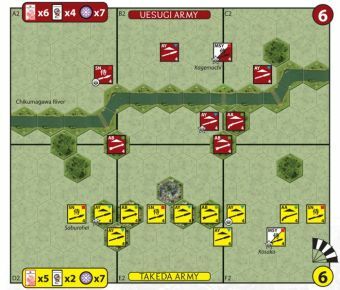 The Uesugi were totally surprised, thrown into confusion, and routed. 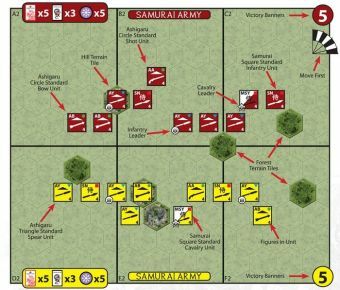 This was Hojo Ujiyasu’s greatest victory and one from which the Uesugi never recovered. * The building tile on the Hojo baseline represents Kawagoe Castle. 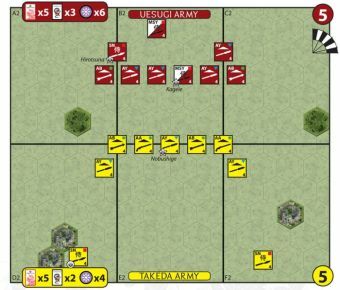 If a Uesugi unit occupies the hex, he immediately collects 3 Victory Banners, which he keeps only so long as he continues to occupy the hex. 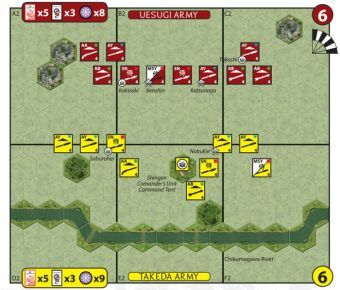 * The Uesugi Command Tent hex is worth 3 Victory Banners to the Hojo player, as per the Command Unit rules on the C&C reference sheet. 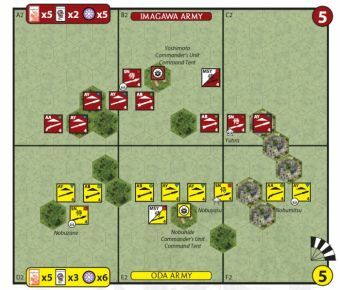 * In close combat rolls, Hojo units ignore the first Honour & Fortune symbol for which they would usually be eligible to collect an Honour & Fortune token. 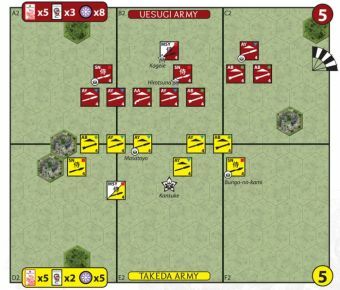 * All ranged fire is reduced by 1 hex range (Ashigaru Archers fire at a maximum of 2 hexes; Ashigaru Arquebus fire with 2 dice at 2 hexes, 1 die at 3 hexes and may not fire at 4 hexes).